A classic comfort food with a Middle Eastern twist. Creamy lentils spiced with cumin and coriander topped with a fluffy sweet potato mash! 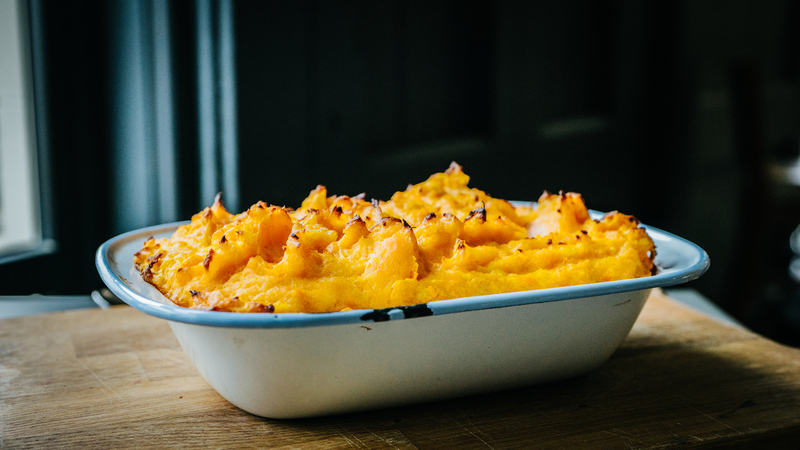 Using half sweet potato and half rooster potato makes the mash lighter in flavour for the sweet potato sceptic! 2. Add the sweet potatoes and rooster potatoes to a large saucepan and cover with cold water. Bring to the boil and simmer for 15-25 minutes until fork tender. 3. When the potato has softened enough, drain the water and mash with a large fork or potato masher. Stir in 1-2 tablespoons of olive oil and mash until smooth. Taste and season with a salt & pepper. 4. In the meantime, heat the olive oil in a large sauté pan. When the oil is hot, add the minced beef and brown for 4-5 minutes. Next add the onion, ginger, garlic and spices to the pan. Stir it all together, coating everything in spice. Add the tomato puree, stock and red lentils. Bring to the boil. Reduce heat and simmer uncovered for 15-18 minutes until slightly thickened. Taste and season with more salt as necessary. 5. Pour the mixture in an oven-safe, ceramic dish then spread the sweet potatoes mash on top. 6. Place in the oven for 15 minutes until coloured and piping hot.